Take the frosty flourish of a chilled glass to the next level with this martini ice liner set. When it comes to martinis, what's cooler than being cool? Ice cold! Simply insert the silicone mold into the included classic martini glass, fill with water, and freeze to form a lining of ice to keep your favorite cocktail chilled to the last sip. Get creative with your freezology by substituting water for mixers, juices, fruit and herbs: A frozen layer of orange juice for a twist on the mimosa, cranberry for a cool cosmo, or lemonade for a puckery lemon drop. Hand-blown glass and silicone mold made in China. Set includes one glass and one silicone mold. I thought you filled the mold and ut it in the freezer. I didn't realize you have to put the mold on the glass, fill with water, then put the whole thing in the freezer. Hard to find room in the freezer for the glass to stand. Wife loved it! Kept the martinis cold and great conversation piece for guests, you should be getting more orders for it. I love the idea. Got two sets, one is a gift. Sad that the construction of the glass itself has a seam you can see and feel around where the stem meets the bowl. Maybe it has to be this way b/c of the freezing??? Not sure. I will try to re-post after I use mine. We got this for the birthday of a friend of ours who loves lemon drop martini's. When she opened the package she beamed. "What a perfect gift for me! I can't wait to use them. In fact, we might need to also purchase the bucket glasses as well for my husband's drinks!" I don't know yet how they have worked for her, but just know that as a gift, this hit the spot! Great product! I purchased the martini ice liners because who wants to drink a warm martini? The quality of the product is excellent. It arrived in upscale packaging and would make a nice gift presentation, although I bought these for myself. 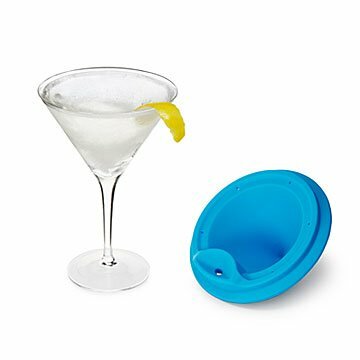 The silicone molds fit snugly onto the martini glass rim and filling with water is easy through the integrated water filler. Once frozen and filled with my favorite cocktail, it looks very cool and held my drink ice cold for at least 30 minutes. I didn't actually time it but it was a long time. I made a couple of these up fort a gathering with a few friends and everyone commented about what a great and unique product it is. Thank you for an ice cold martini! Wow !! Very Cool, it really works. Very nicely packaged. It came with a simple instruction and suggestion card. Can't wait to try it with some creative frozen liners like cranberry juice for a cosmo. A simple and fun addition to my home bar. I like my martinis very cold (shaken, not stirred). I still make them the same way, but they stay really cold for quite a while with the ice lined glasses. I always have made very cold martinis, but the trick is to keep them cold until I finish them. This product keeps my martinis cold for quite a while and doesn't seem to dilute the drink! Love the Martini Ice Liners! I love how easy it is to use the Martini Ice Liners. Besides keeping a drink cold, the frozen/lined glasses are impressive to look at. They make any drink seem extra special. I like to use juice for a more flavorful and colorful option. The ice-lined martini is also a great way to serve shrimp cocktail.